A way to speed up quantum computer tech progress has arrived from Intel. If you are interested in following the waves and advances in quantum computing, then get familiar with this word trio: Cryogenic Wafer Prober. Before their design, the electrical characterization of qubits was slower than with traditional transistors. Even small subsets of data might take days to collect. Drug development. Chemistry. Climate change. Financial modeling. Scientists in all areas look forward to more advancements to push quantum computers to the frontlines. Speeding progress could also mean speeding up advancements in science and industry. "Quantum computing, in essence, is the ultimate in parallel computing, with the potential to tackle problems conventional computers can't handle," said Intel. In turn, interest is high over the quantum computing testing tool: Intel, Bluefors and Afore introduced a cryoprober, a quantum testing device, and it is named the Cryogenic Wafer Prober. Intel developed the prober with the other two companies. An Intel-bred description: Cryogenic Wafer Prober is a cryoprober tool. It has been designed to test and validate qubits needed for quantum computing. The quantum chips are called qubits. As far as MIT Technology Review's The Download can see it, Intel's prober is a big deal because it means speeding up the testing of quantum bit, or qubits. The latter, after all, are the key to "the potential power" of quantum computers. How quantum computers and their chips are usually tested: TweakTown's Anthony Garreffa walked it through. Think "super-low temperature dilution refrigerator," to see what works out and what does not. Each quantum processor is tested for months in a low-temperature dilution refrigerator. Tweaks can be sent to manufacturing before the chips are made. With the prober, researchers can test qubits on 300mm wafers down to temperatures of a few kelvins. There is a timing advantage. Intel can characterize a large subset of these transistors on a 300mm wafer in about an hour and inform the feedback loop back to the fabrication line. What can the cryoprober tell Intel? Lucian Armasu in Tom's Hardware said the prober allows Intel to automate and collect information on spin qubits, such as the sources of quantum noise, the quality of quantum dots and the materials that can be used to create the spin qubits." The Feb. 28 news release explained the temperature factor: for quantum computing, turn-on characteristics of qubits must be measured at low temperatures of less than a few kelvins above absolute zero. Dean Pennington in TechSpot explained: "Because the characteristics of qubits must be measured at extremely low temperatures, the equipment and technological limitations of existing testing environments meant small subsets of data often took days to collect in conventional dilution refrigerators. The cryoprober tool will allow Intel to automate and collect information on qubits in a matter of minutes." The Intel site carried a graphic showing the tool's ability to create a statistical correlation of the increase in turn-on voltage between (1) room temperature and (2) cryogenic temperature. Why the tool matters: The tool can scale up the manufacture of silicon quantum computers, said Garreffa, with less issues. As for the scaling issue, The Download, in the post by Martin Giles, reflected on "scaling." It's a question. For quantum machines to be effective, the requirements are "vast numbers of qubits" for quantum machines. There are challenges to that requirement. The tiniest vibration. Changes in temperature. Then, qubits may lose their fragile quantum state. While thinking about how to scale the manufacturing makes sense, said The Download, some experts think this "noise" issue "could prevent the computers from ever going mainstream." In order to build the Cryogenic Wafer Prober, Intel approached Bluefors and Afore. Why Bluefors? 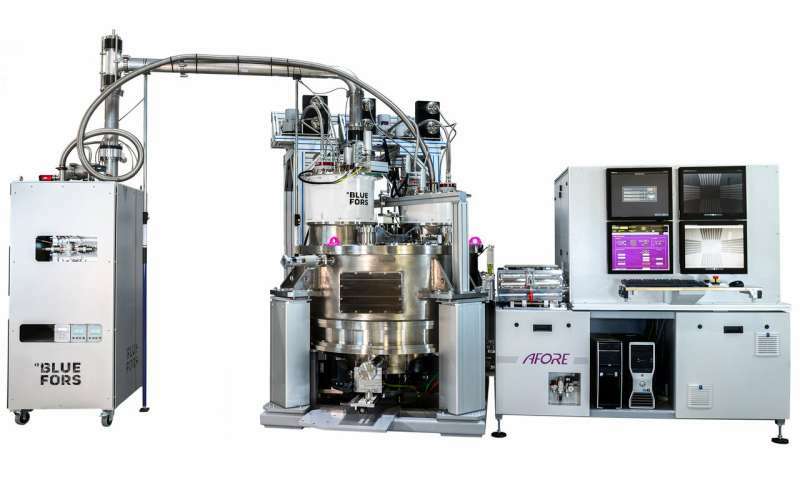 They are noted for building cryogen-free dilution refrigerator systems with a focus on quantum computing, and Afore is noted for micro-electro-mechanical systems (MEMS) test solutions. Moving forward, the first Cryogenic Wafer Prober will be located at Intel's Oregon campus. Anyone out there know what a Base 4 quantum particle with four parts is called? For instance Base 2 is a qubit and Base 3 is a qutrit. So would a Base 4 quantum entangled particle be called a qutet or something like that which stands for tetrad (tetrade)?